4 Spanish Recipes You Should Make at Home Tonight! Until a few years ago, I was not a fan of Spanish cuisine. Truthfully I really had no idea what “Spanish” food was aside from paella. Rumor had it that the flavors were dull and pork reigned supreme. There might be some truth to that but with many visits to Spain under my belt now I have come to appreciate just how varied and wonderful the culinary culture is – even if I don’t eat pork. In December my friend and travel partner in crime Sofie of Wonderful Wanderings was going to Seville to take a Spanish language course. Seville is a 1 hour flight from Marrakech and easily one of my favorite places on Earth. Seriously. So, when she asked if I might want to come to visit while she was there the answer was obvious. Heck yes! I knew she would have classes every morning and while I could have opted to just lazy about the apartment I realized I could use this time to do something I really wanted. I love cooking but it has been a long time since I really challenged myself to learn a new cuisine. Most of my cooking of late is either making meals at home for the family or tinkering with Moroccan recipes. This was an opportunity to really go in depth with Andalucian cuisine hands on. I’ve always wanted to learn more about this region’s cuisine because of the combination of Arabic and European influences that make it up. I reached out to Not Just a Tourist, a company I had previously done a food tour with in Seville to see if they could help with my special request. I didn’t just want a few hour class, and I didn’t want a class where I was just cutting onions. I really wanted to spend several days immersed and cooking a wide variety of dishes. That is exactly what I got. On my first day it was a trip to the market to pick up the items we’d need for class that day and talk a little about what else we would make over the three days I would be cooking. I cooked and ate so many dishes but decided to share four of them with you. These were my favorite and I think they are versatile enough that you can use them in several different ways. 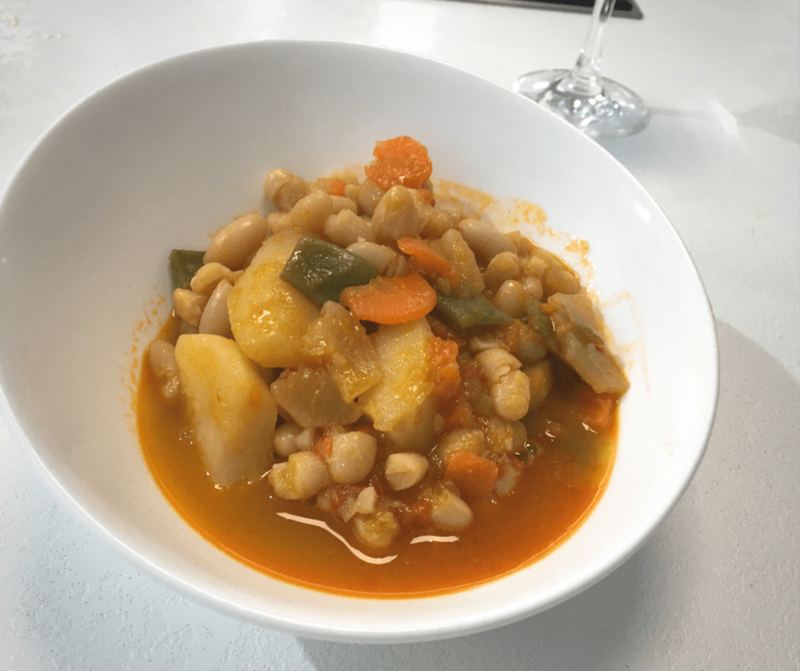 Cold soups are a big part of southern Spanish food culture. But I’m not talking about gazpacho. No, not at all. 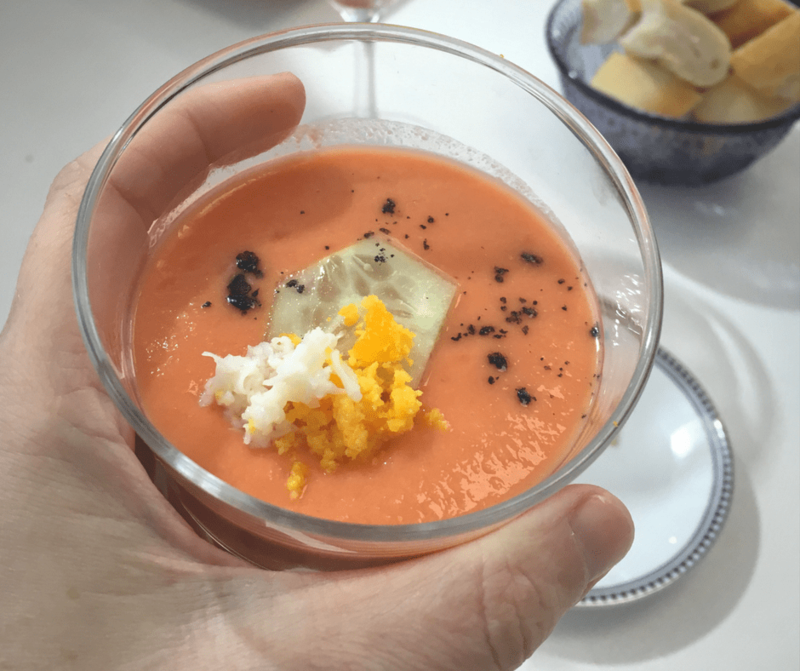 Salmorejo and Ajo Blanco are two varieties of cold soups popular in the summer months. They’re so popular in fact that my teacher told me people are having cold soup bars at their wedding parties and serving variations of these soups and more. I didn’t know I could like cold soup so much until I made these. You can’t visit Seville without having this at least once. Even though it’s meant for summer, many places have it in the winter too – mostly for tourists who aren’t arriving in the hotter months. This dish is really easy to make at home. Add the tomatoes and garlic to a blender and begin to mix. Rip up the bread roll and add pieces so that it incorporates with the mixture. Once blended taste the mixture and add salt and red wine vinegar. A small amount of each to begin with and adjust to your taste. Slowly pour the olive oil into the running blender to emulsify the oil. Once the oil has been incorporated transfer the mixture to a bowl and refrigerate for a minimum of 4 hours. The soup can be served as is or garnish with slices of cucumber, chopped hard boiled eggs, or the traditional way of serrano ham. The literal translation of this soup is “white garlic” and so it shouldn’t be a big surprise that this is a garlic soup. I really love the story of how this soup came to be. It’s an incredibly old recipe and the mixture of cultures makes me smile – even if the story is a bit sad. When the Romans conquered the Iberian Peninsula men were given land after serving in the army for seven years. These people were often quite poor and a staple of their diet was bread spread with a garlic paste. Remember, tomatoes hadn’t arrived in Spain yet as this was before the discovery of the “new world.” Later, after the Arabs arrived almonds were added to the mixture to adjust the taste. It’s one of the original soups of Europe! In a blender add the almonds, garlic, and water and begin to blend. Rip the bread and add pieces to the soup mixture to puree. While the blending is running add the vinegar. Blend for 2-3 minutes until a smooth consistency is reached. Slowly pour the olive oil into the soup to emulsify. If you want a more garlicky soup you can add more garlic but remember the flavor will get stronger as it chills. I suggest making it once by the recipe and then adjusting the next time. Garnishes: Diced green apple, cucumber and onions tossed in vinegar and olive oil make a nice condiment for the top. 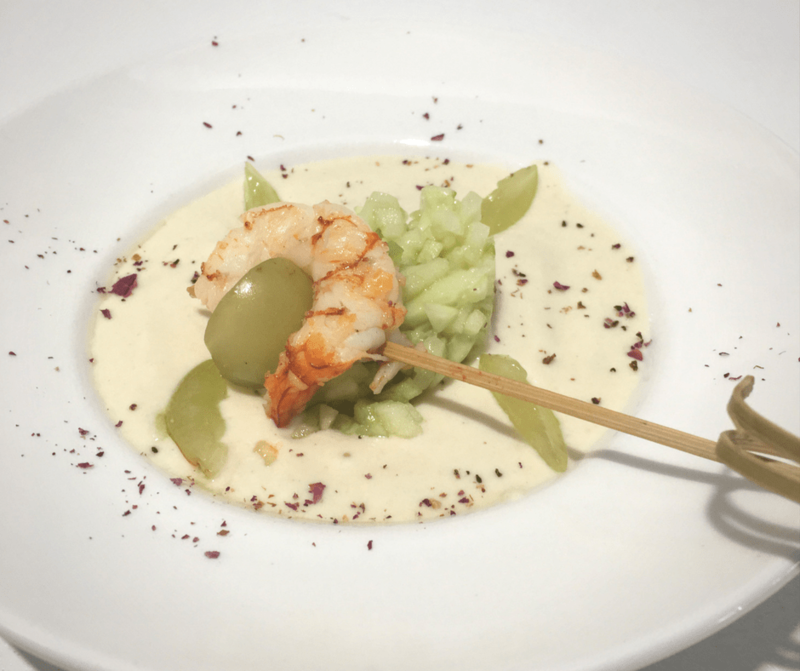 You also could garnish with a quick grilled prawn and green grapes. A small dusting of smoked paprika also dresses it up. This is a take on a classic tapas called habas con jamon or broad beans with ham. As we don’t eat pork I was looking for dishes that I could make that would be authentic but we could still eat. This dish delivered and to be honest, I think that I prefer it more this way (I do still remember what ham tastes like!) 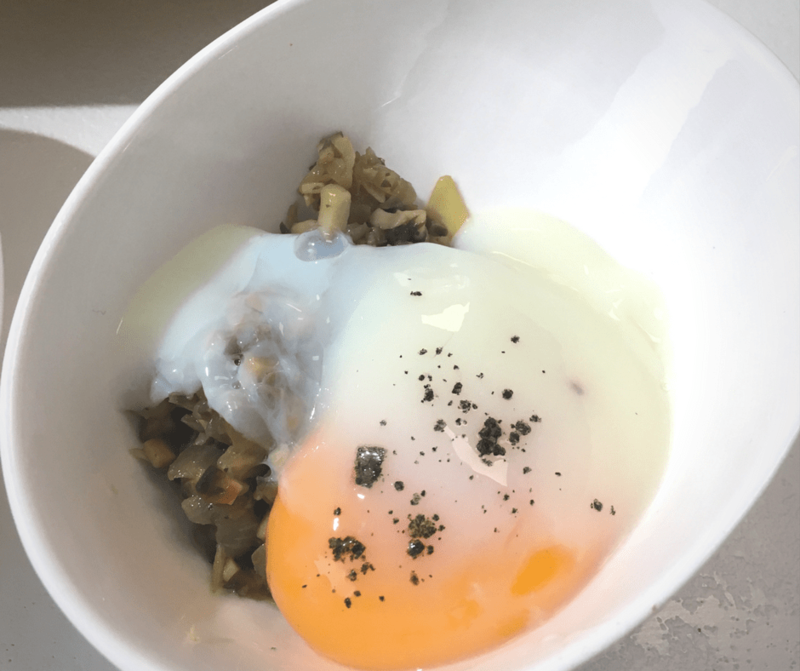 This can be served as a tapas or a side dish to a main meal with or without the egg. I also think it makes for a great breakfast with some toast! Clean beans, cut into 3-4 centimeter pieces and blanch. Add olive oil to a cooking pan and heat to medium high heat. Place the 3 cloves of garlic into the oil and gently cook until they begin to brown. Remove from the pan and discard. This will add the flavor to the oil without the bitterness of cooked garlic. Finely dice 1/2 an onion and add to the oil. Reduce heat. Cook the onion until it begins to almost caramelize. Add the sherry wine to the onions and turn up the heat. Add the strained beans and season with salt and pepper. Finely dice the mushrooms and add them to the mixture until soft. Portion mixture to four bowls while poaching one egg to top each dish. This dish is one of those classic comfort foods you find in every culture. It’s also a catch-all dish. Women would put together the odds and ends left in the pantry to make this. Just like red beans and rice in New Orleans, this dish was typically made for wash day. Something that could be on the stove cooking while she was otherwise busy. Traditionally it’s made with chorize (and if you want that recipe check out Lauren’s blog Spanish Sabores to make it). The vegetables used here are just suggestions, feel free to use what you have. In a large pot, cover the bottom with olive oil and add the garlic. Saute until browned and then remove from the oil and discard. Chop all of the vegetables into pieces of equal size. In the oil, add the leek and peppers and cook 2-3 minutes. Add the chopped vegetables in order of hardest to softest texture. Mix well. Drain the beans and add to the pot along with the 3 liters of water. Bring stew to a boil for 10 minutes and then reduce the heat. Cook for about 1 hour. Test the beans to see if softened and adjust water throughout cooking time to make sure everything remains covered. The stew can be eaten immediately or left overnight and reheated the next day. While I loved it right out of the pot, it’s supposed to be even more flavorful on day 2. If you’re planning to visit Seville I highly recommend checking out the food culture. You can check out some great tours on Bookmundi. Challenge what you think you know about Spanish food when you go! Some of my other favorite things to do in Seville include visiting the Real Alcazar, taking a bike ride in Parc Maria Luisa and seeing the Plaza Espana.